Patricia D. “Patsy” Warmack, passed away on June 7, 2017, surrounded by family and friends. Patsy was born August 8, 1941 in Pensacola, Florida, to the late Rufus James Hammons and Catherine Louise Hammons. She moved to Tallahassee as a young teenager and attended Leon High School where she met the love her life William ‘Billy’ Warmack. She and Billy were married in 1959. Patsy worked for years alongside Billy in their family concrete business. Later, she worked at Florida State University, and retired from Tallahassee Community College. Most recently, she loved time spent at Bradley’s Country Store where she was the smiling face behind the register. Patsy was a member of Pisgah United Methodist Church. Her greatest joy was raising three girls and a host of their friends, and being Nana to her beautiful granddaughters Jill and Carly. She also had the pleasure of working with the International Order of Rainbow for Girls for over 40 years, and impacted the lives of countless young ladies who referred to her as “Mom Mack”. She served on the Friends of Tallahassee Parks Board for many years, and was a member of the Tallahassee Garden Club. Patsy was preceded in death by her husband William “Billy” Warmack; her mother Catherine Louise Hammons and father Rufus Hammons; sister Joyce Lee; brother, Donald Hammons; brothers-in-law Robert Lee and Roy “Buster” Warmack, and sisters in law Carolyn Warmack, and Judy Richart. Patsy leaves behind to cherish her memory, daughters Debbie Kirkland, Eleanor Warmack and Cathy Warmack; granddaughters Jillian Kirkland and Carly Kirkland Webb and husband Trip Webb; brother, Douglas Hammons (Peggy); sisters-in law Peggy Hammons and Joan "Tency" Warmack; and seventeen nephews and nieces. A Celebration of Life Service will be held 5:30 p.m. Monday, June 19, 2017 at the Retreat at Bradley’s Pond. 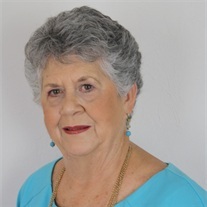 In lieu of flowers memorial contributions may be made to Grand Assembly of Florida, in Memory of Patsy Memorial, 1311 Avalon Blvd., Casselberry, FL 32707 or Big Bend Hospice, 1723 Mahan Center Blvd. Tallahassee, FL 32308.